Deputy Commissioner, Lakhimpur recruitment notification 2018 is out for filling up various posts. According to the DC Office Lakhimpur Recruitment 2018 Applications are hereby invited from the intending candidates in standard Form of application in part II of Assam Gazette for engagement of 6 (Six) number of Technical Support Person/ data entry operator at the Revenue Circle Offices of Lakhimpur district as mentioned below for a period of 3 (three) months @ fixed remuneration of Rs. 6000/- (Rupees six thousand) only per month. 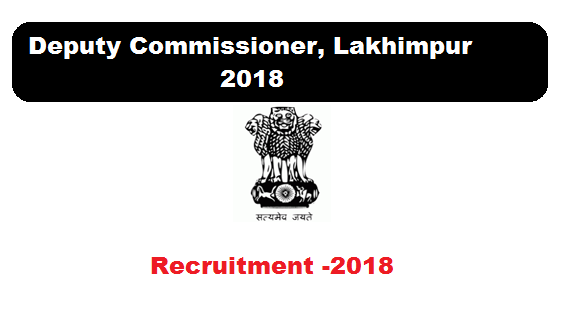 Following are the details of the posts under Deputy Commissioner, Lakhimpur Recruitment 2018 with post details, number of vacancies, age limit, salary, required qualification with application details. Educational Qualification: Candidates shall submit their applications at the respective Revenue Circle Office. Candidates must be minimum HSSLC passed with at least 6 (six) months Diploma holder in Computer Applications with proficiency in MS-Office both in English and Assamese. A walk-in-interview of the eligible candidates shall be held at the respective Revenue Circle Office or the district mentioned above on 24th March 20I8 at 10 AM, where they wish to work as T.S.P. The candidates shall also give an undertaking that they have not applied in other Circle Office. The candidates shall bring with them (i) 3 (three) copies of recent Passport size photographs (ii) Certificates of educational qualification (iii) Age proof document while coming to appear at the walk-in-interview as scheduled above.